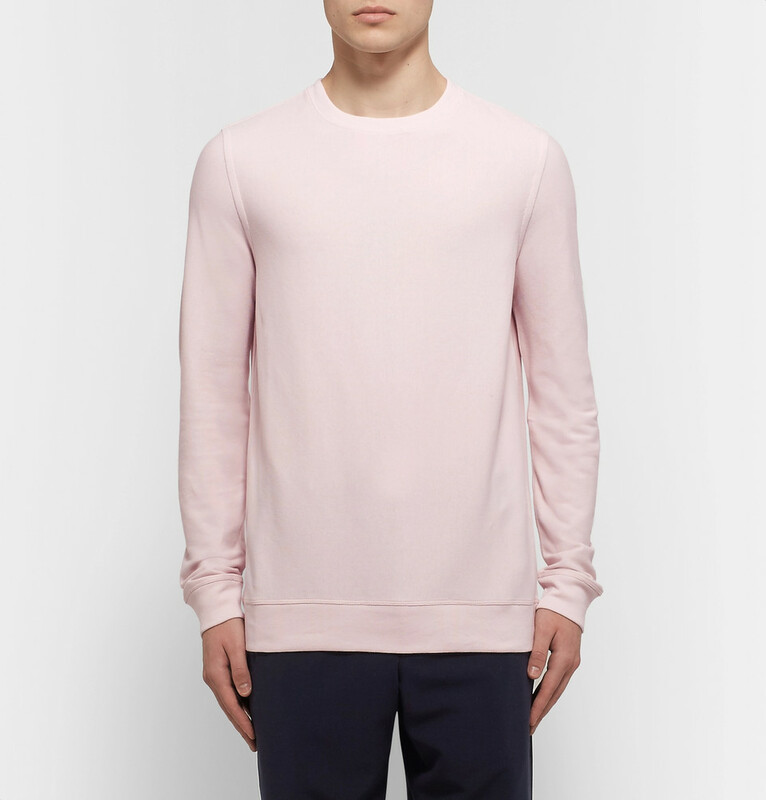 Pink style for men isn’t what it used to be. In past fashion climates, it was reserved for the WASP-dandy-prep subsets, applied in pastel to polo shirts, seersucker, and the occasional oxford shirt. Perhaps as background to (*shudder*) a chino pant embroidered with little lobsters. I take it as a sign that my favorite pizzeria in Milan was done up in pink with black trim à la Michelle Pfeiffer/Catwoman. Sidebar: I also found the prolific pink in Black Mirror’s Nosedive to be apropos for a satirical critique of picture-perfect social media “life” and reputations. MR PORTER noted that it’s a new neutral, like gray in its versatility and applicability. I promise, I had this post drafted before that article came across my inbox! As far back as two years, I started to notice pinks that I like. I remember one Saint Laurent backpack, now quite ubiquitous, in dusty pink that I absolutely pined. This current version in black with printed pink flamingos is a fun substitute. A brief search of Shopstyle yields hundreds of choices for the modern man in search of pink pops (or muted exclamations). This jacket from Stone Island is particularly interesting for both its texture and color, a “rose quartz” in crinkled nylon. Last summer in Stockholm, I fell in love with Acne Studios’ line of canvas bags, one colorway of which was (soft) coral pink. Simple, elegant, structured and oh so tropical. They also make putty pink underwear packaging. The Paul Smith store in Milan is completely pink in a Southwestern US adobe style. Even has terrazzo floors, all the rage now (again). Millennial pink is appealing because it’s relaxing, reminiscent of sunsets, flowers, and confections. It’s not as aggressive as red, not tart like orange and yellow can be, and not quite the pretty pink we associate with Barbie. It’s a nod to warmth, to passion, and to the zeitgeist. I asked a few of my male friends to let me show off their favorite pink clothing and accessories as examples of embracing pink style for men. First, Rob in a pink blazer by Topman and pants by Dsquared2, and then John William with touches of pink from Etro, Stubbs & Wootton, and Christian Louboutin. Shocking pink suede Christian Louboutin cap-toe flats for men!